Merry Christmas & Seasons Greetings to All! In our quest for the best. Along with the myriad requests, future planning, and regular archives work that we completed this year, we have also been hard at work on some special projects. 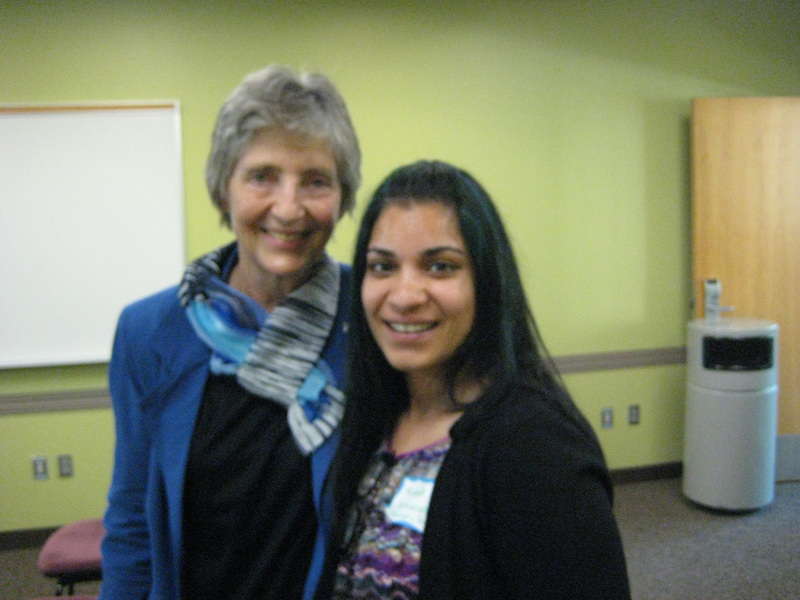 In July of this year I gave my first talk for the IBVM for the Toronto Branch of the Ontario Genealogical Society. 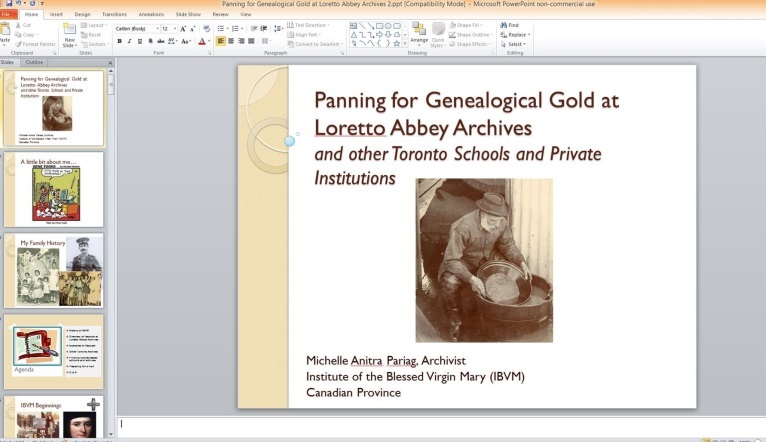 The session was entitled “Panning for Genealogical Gold in the Loretto Abbey Archives and other Toronto Schools and Private Institutions.” I outlined the resources that we have at the archives, walked the participants through how we respond to a request, gave a brief survey on similar school archives and provided basic advice for people who were interested in contacting an archive. 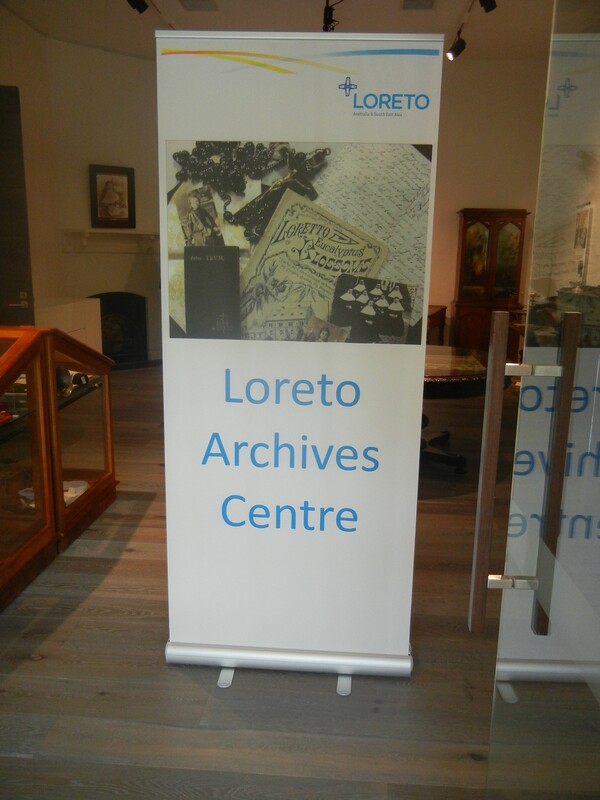 It was well-received and we had a number of Loretto-specific requests which were generated from this. It never fails to amaze me how many people “out-there” have links to Loretto! 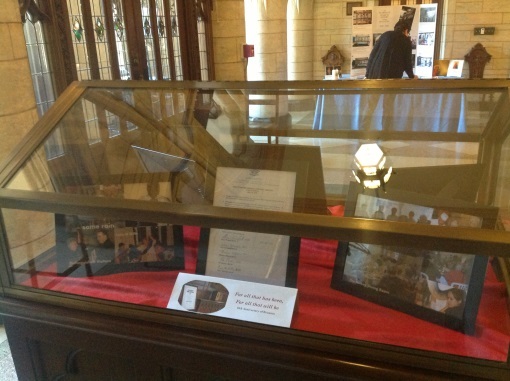 Our main display case at the entrance of the Abbey was revamped for the 2014 reunion celebrations (Canadian and Irish Province, ten years). We had such positive reactions from our sisters and visitors that we have decided to try to change the display more frequently. We have already replaced that display with one featuring some of the photos we retrieved when we converted images from traditional slides to digital format, and after that – a Christmas theme. Still in the planning process is collaboration with the Loretto Abbey High School Parents’ Association to conduct a night of tours of the Abbey for parents as a fundraiser. While I did not attend the event in its entirety, I did manage to attend some of the conference. I found this helpful on various levels. From the beginning it proved to be a great opportunity since I was able to meet and interact with some our Sisters from the US province. Attending allowed me to strengthen my understanding of Ignatian Spirtuality in a more concentrated and dedicated way than my previous research had done. It also allowed me to experience first-hand one of our Institute events which provided me with personal experience of the types of events that we record in our archives. My favourite “take-away” was definitely the Ignatian idea of the Daily Examen – I really took to the idea of daily, consciously considering one’s actions. I was asked to help with preparations for our Province’s GC14 meetings and felt extremely honoured when I was invited to attend. Again, from an archival standpoint, I was able to gain first-hand experience of what one of these types of meeting is actually like. We often encounter agendas, minutes, accounts etc. in the archives, of course, but being able to attend gave me a better sense of what they are actually like. It was a large gathering of Sisters, associates and some staff. We viewed a video and then shared our reactions, thoughts and ideas in smaller groups. The video was excellently executed and if you get the chance to see it – you won’t miss the mention of the institute archivists! Sharing in this way, I was able to interact and get to know some of the sisters that I don’t always see/get a chance to talk to at the Abbey. When we received word that Sr. Kathleen would be presenting at this conference last year, I didn’t imagine that I would get the opportunity to attend! It was amazing being able to reconnect, and also support her while she spoke. I could compare the importance and usefulness of this conference to the one we (Sr. Kathleen, Áine, Robin and I) attended in Dublin. 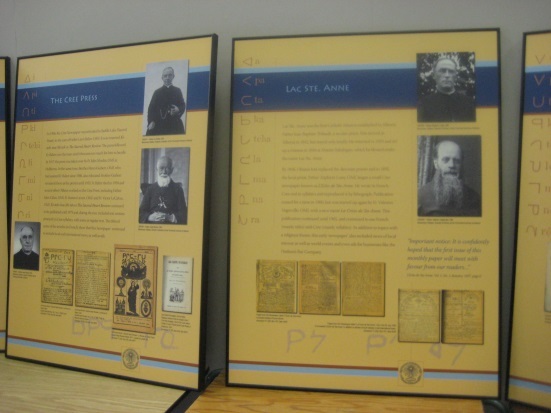 Being specifically about women religious, almost every session was relevant and presented strains of research that could be undertaken in our own archives. It is so important to see how archival materials are being used (which informs us further on what to weed out, what to keep) and how researchers are engaging the archives and archivists (many positive experiences, some bad). As archivists at this type of conference, our contributions regarding practices, as well as advice and opinions, are appreciated. One of our major achievements this year was definitely the completion of the official Archives Policy of the Institute of the Blessed Virgin Mary (Loreto/Loretto). It is an amazing example of how we can work together as archivists on a specific project from different corners of the world! It took many hours of meeting and corresponding via email with the aim of planning, drafting and editing to create the comprehensive and inclusive document that reflects the IBVM constitutions, the diverse Provinces of the IBVM and archival standards. Policy making is good practice — ensuring the professional and effective organization of our particular branch of ministry in the archives. The Policies document will hopefully promote harmony amongst our archivists working in various areas internationally, in variant circumstances. 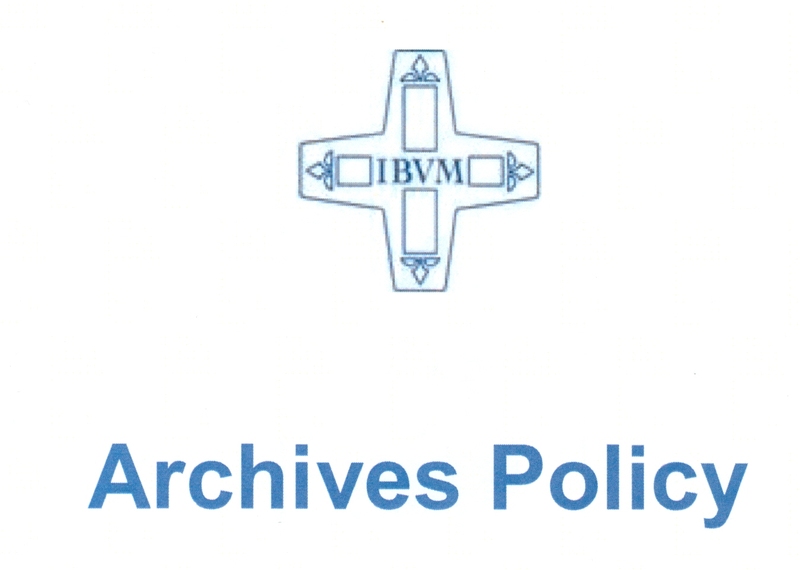 These policies help us better understand our role and responsibilities and guide our daily work by outlining the expectations and standards for IBVM archivists. 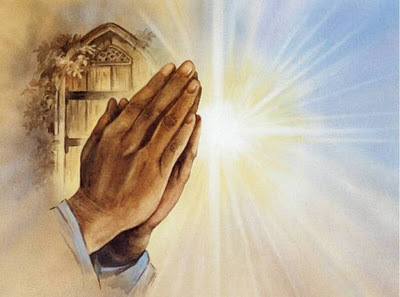 Importantly, they provide us with guidance and prevent ambiguity on what should/must be done in a particular circumstance or with regard to a certain issue. Going forward, it will help newcomers to the IBVM archivist family to familiarize themselves with the culture and standards with which we hope to function. Additionally, the inclusion of examples of various archives forms (Reading Room Rules etc.) are a practical resource. We have already “tweaked” our version (as suggested) to reflect the Canadian Province and are ready to put them to good use! Thank-you from all of us to Áine, who has updated the “Directory of IBVM Archivists” again. It was wonderful to read the short introductions and to get a chance to become acquainted with our counterparts worldwide. 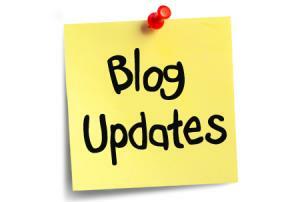 With all that has been going on this year, we have taken an extended break from updating this blog. Thank you, Robin, for updating us on what has been going on in the Australian Province Archives. This week I’ll be adding updates on some of our collaborative work, as well as brief entries on some of the Canadian Province’s activities. 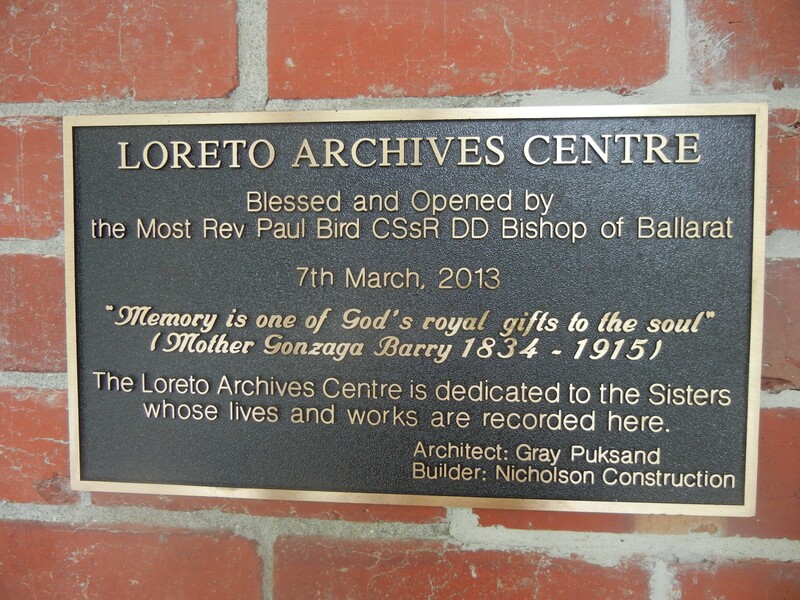 The year started well with the opening of our new Loreto Archives Centre in Ballarat which has meant lots of visitors to welcome. This has given us the opportunity to spruik the benefits of collecting and keeping archives and has meant that we have had an increase in donations and transfer of interesting material. It certainly helps to be able to reassure people that not only are their precious records and artifacts wanted and needed for the collection but that they will be well looked after. The siting and accessibility of the Archives Centre has also meant that students and past pupils have easy access. 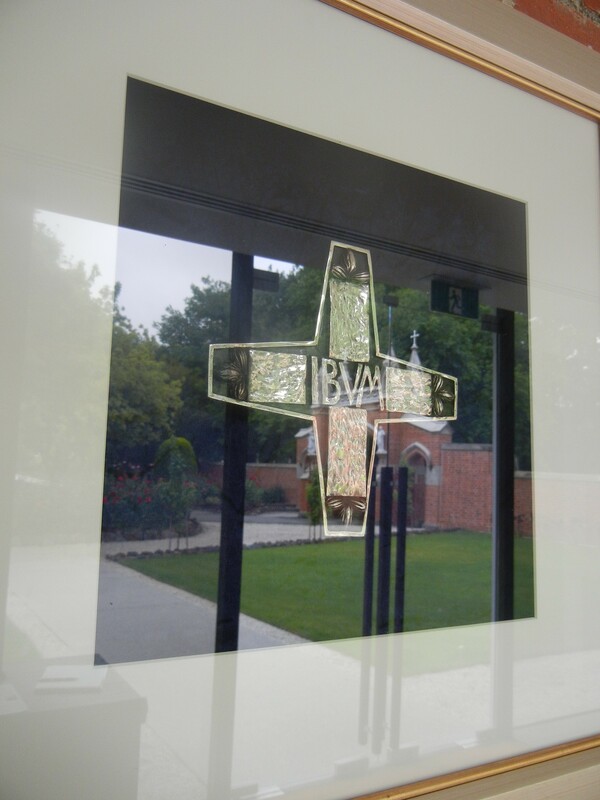 Our Display Gallery has become a starting point for tours of Mary’s Mount, Loreto College Ballarat, and for induction tours for staff and students. We have had overseas visitors, Loreto and CJ Sisters, archivists, historical societies, Probus groups, the Mission and Identity Workshop participants, Loreto student leaders, Mary Ward Connect delegates, school principals, and even a car club! It has also become a focus for past pupil reunions; a reunion for Loreto boys taking place for the first time. A busy time with enquiries, most of which are via email or the website. We answered over 300 this year, some more complex than others, of course. I am sure that my fellow archivists will agree that it is the best part of the job to be able to successfully and efficiently access records which have been painstakingly documented and to answer an enquiry. So often it is an exchange of information, too, with the enquirer contributing as much as is held in the archives. One of our roles, is to mentor and advise other archivists and organisations on archives management. 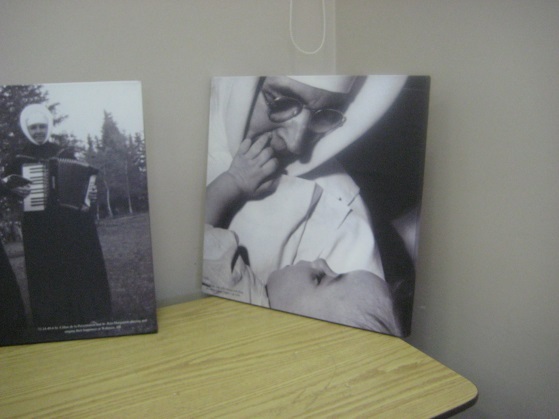 I was asked to help ACRATH (Australian Catholic Religious Against Trafficking in Humans) set up and maintain their archives. We prepared a Records Retention Schedule for the organisation for the on-going development of the collection, arranged and documented records into series, listed and boxed. It was a wonderful opportunity to set up an archives early in the history of an organisation. It has also been a year of oral history. We interviewed Sisters from the Ballarat community and Mary’s Mount past pupils from the 1930s and learnt about the past from these women who have lived long and interesting lives. We hope to edit material for use in our Display Gallery. So, in the hope that 2014 is wonderful for my colleagues and the friends of archives and wishing you a very Happy Christmas.